I have a few pieces of real jewelry that I treasure. But most of my jewelry collection consists of costume jewelry that I don’t have to be so afraid to lose or wreck. I also prefer buying less expensive accessories because it allows me to try out trendier pieces without worrying about whether or not they’ll still be in style next season. 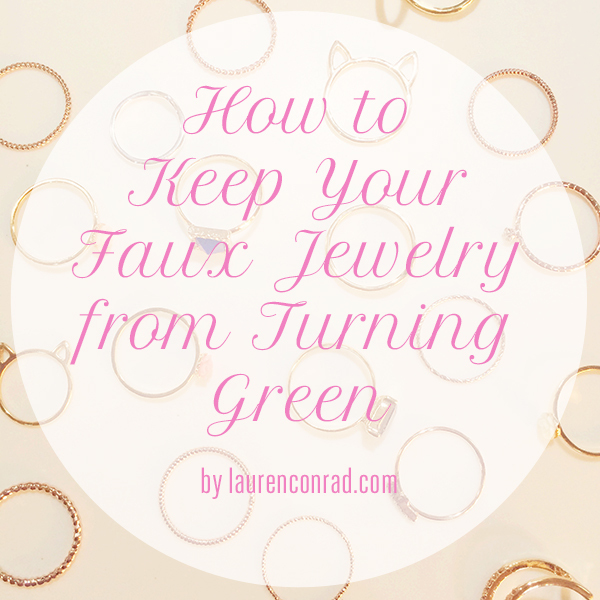 However, one of my pet peeves when it comes to buying costume jewelry is how it can stain your skin green. It turns out that those green stains are a result of the metal reacting with your skin. Copper is usually the culprit, but even silver can oxidize when it comes in contact with your skin. Luckily, I have a tried and true trick for preventing that dreaded green ring. Whenever I buy jewelry that is made of a less expensive metal, I coat any part that comes in contact with my skin with a thin layer of clear nail polish. So, with rings I coat just the inside, and with necklace charms I apply clear polish to the back. You may need to reapply the coating from time to time since it can wear away, but it’s a pretty foolproof solution. Are you going to give my little trick a try? Giveaway: Pin to Win $100 to Kohl’s!